The year’s end is still a few weeks off, but things are gearing down here at the castle and winery. It's a good time for a first look back at the year that was and to look ahead to what’s next. Regular activities at the castle (hotel, weddings and other festivities, cultural events) have been just that: Pretty regular. Regular in the sense of us having had about the same number of guests and events as in the previous years. The calendar of cultural events for 2016 has already been published on the German site (http://barockschloss.de/kalender/). That calendar also shows the winery’s events that - obviously - center on wine (wine festival in the castle courtyard, picnic in the garden etc.). 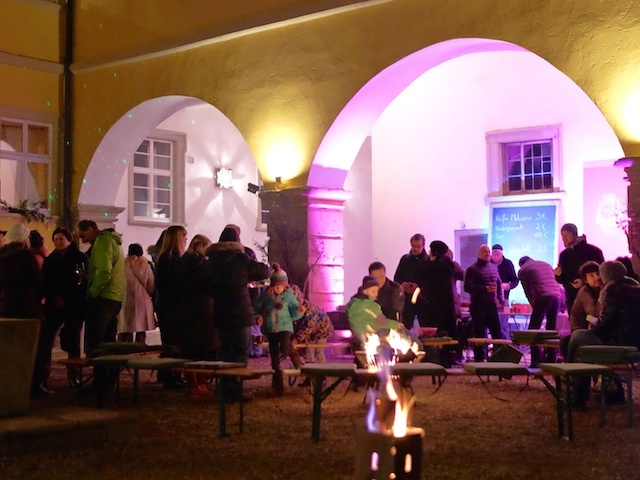 There is one such event still ahead of us this year: On December 6th, which is celebrated as a Holiday for St. Nicholas here in Germany, our winery will be hosting an evening with hot mulled wine around a bonfire in the castle courtyard. The hotel closes after that until the end of February. Visitors to the winery are welcome for wine tastings throughout the winter, however. Just give us a day or two heads up so we can turn the heat up a little! Not everyone is used to castle life in the winter. It has been an excellent year for the winery, both in the sense of having had an excellent harvest with grape qualities allowing us to make our top of the line wines this year and in having success with wine critics and gaining new customers and resellers. Just this month we received news that we will be featured in the Eichelmann Wine Guide 2016, one of Germany’s two top wine guides with ratings for the country’s most accomplished wineries. Another milestone: Germany’s wine magazine „Selection“ awarded us their first prize in the „Silvaner“ category (which is our region’s most important grape variety) in their „Germany’s Best Young Wine Maker of the Year“ award (our wine maker Christian, who studied oenology at Geisenheim University, is just under 35 and therefor eligible to enter). Obviously we are proud that our hard work in the vineyards and cellar is being honored by customers and critics alike. We haven’t attempted to find an importer and reseller for our wines to the United States yet. If you know of someone who might be interested, please let us know. And please come visit us yourself for a stay at the castle with or without a wine tasting! The vines in our vineyards are in bloom. Yes, grapes have blossoms too. Very small ones, though, so you really have to get up close and personal to truly appreciate them. They depend on wind for fertilization and by some wonderful miracle of nature it works every year. We are now busy in our vineyards tackling the growth of vines and leaves by packing everything neatly and lightly into the wire frames so the vines can grow strong and straight up while the grapes grow and have air to breathe and to stay dry and comfy. We had our annual Castle Wine Festival an June 4th, a Thursday and Catholic (so also Bavarian) holiday. That was a lot of fun and many friends of the castle and the winery came to visit. Today there is a big wedding party in the biggest of our banqueting halls. Smack dab back in the busiest season of the year! If you’ve ever been to a German wine festival (Weinfest) in one of Germany’s 13 wine-growing regions such as ours here in Franconia (Franken), you’ve probably seen one of the many „wine princesses“. Almost every village has one who usually „reigns“ for about two years representing the village, its wines and wine growers. But only one of these princesses per region can become wine queen of the entire region for a year. Each region has an annual contest/election once a year (at different times throughout the year). The elected queen then has a chance at becoming Germany’s wine queen. Franken elected its wine queen for the reign of 2015/2016 today. Six contestants tried for the job that entails numerous events nationally and internationally representing the region’s wine throughout the year. Only one can and will be queen. And the winner is… Kristin Langmann. She is one of only two candidates who visited our winery before the election to let uns explain our winery concept and to taste our wines. So, obviously, she was one of our two favorites to win. The hotel has been closed over the winter and is about to open its doors back up to the general public, be it overnight-hotel-guests or visitors of our cultural events and wine tastings. The first big one of this sort will be our annual Easter Market on Sunday, March 15th (always held 3 weeks before Easter Sunday). Visitors will also get a chance to taste our wines on that day. In the vineyards work is continuing with pruning. Back at the winery we have been busy bottling wines that will hit the shelves around May. Work in the vineyards had ceased after the harvest in October. Now we are back out in the Great Outdoors pruning the vines for what what will become our 2014 vintage. While last year's wine is maturing wonderfully in the cellar, waiting to be bottled in February, we are already busy preparing ourselves - and our vines - for vintage 2013. We are now pruning our grape vines, thereby setting the stage for this year's growth. 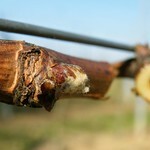 This is done by selecting a hopeful fruit cane from last year's growth that grows nicely, close to the head of the wine on two-year-old wood. A second fruit cane is also left standing - at least until after the ground frosts we sometimes experience in early May, after which the better of the two "candidates" is kept. All other growth from last year is then carefully cut away and removed, the two remaining fruit canes cleaned of shoots and clingers, that might impede its growth. This will take us another few weeks. 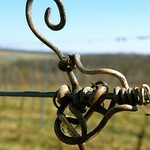 Then we can look forward to Spring bringing our dormant vines back to life! We have been working in our vineyards throughout the year, all the while looking forward to the harvest which is now upon us. We harvested the first grapes last Tuesday. The various grape varieties will continue to be harvested over the next few weeks. 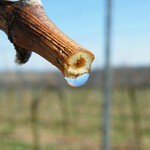 The great news so far: 2012 is promising to become an awesome vintage! My two colleagues and I used last week's perfect weather to get some work done in our vineyards. We placed so-called nursery cartons (protective sleeves) around the newly planted vines to protect them from wind and cold. It's almost like rearing children (minus the back talk! Just kidding…). Removing high-growing grass from underneath the budding vines, which would negatively influence the chance of frost damages (there are usually a few days of early-morning frost here in early to mid March), was tough manual labor. But caring for each vine is certainly also a very rewarding enterprise. Now we are experiencing two days of solid rain. A chance to recuperate from last week's work before we head back out this coming week. Visitors to the castle have often asked me: "Do you have your winery, too?". I'd always have to say, regretfully, no. That is about to change. Together with two partners I founded the castle-own winery "Weingut Barockschloss". We are starting out small and are tending about 7,000 grape vines of different varietals in the first 1-2 years. 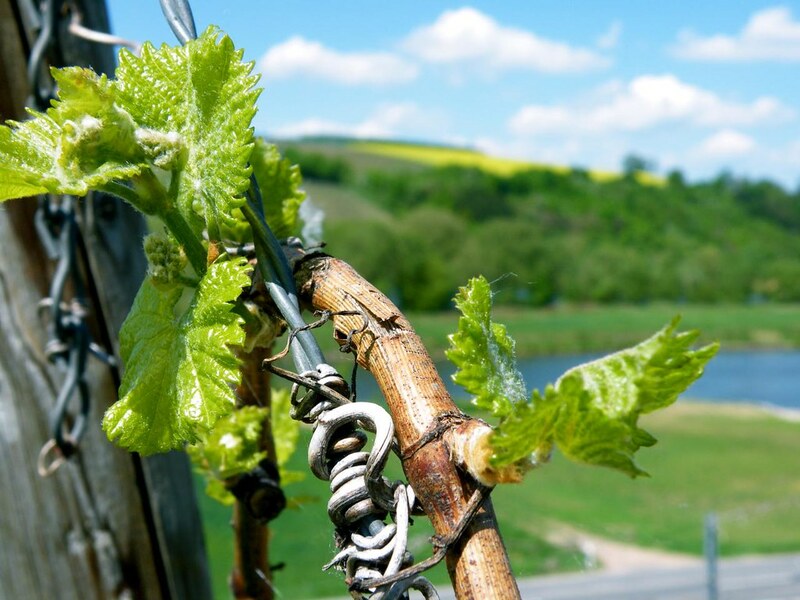 Our first vintage is growing now in the nearby vineyards overlooking the Main River Valley. Pruning is over and we are currently busy repairing some of the older posts. After the wine harvest this Fall our winemaker Christian will tend to the wine we will present to the world in May 2013. Stay tuned for news from the castle winery and be sure to visit us next year to taste our wines in situ. Of course you will also be able to taste good regional wines at the castle until then, too.